Hanukkah is right around the corner. That means celebrating with family and friends – what a joyous time! We always enjoy hosting our Hanukkah dinner party for friends and family. It’s an evening filled with so many good times, conversation and –of course– excellent food. Sometimes, it’s a long process. 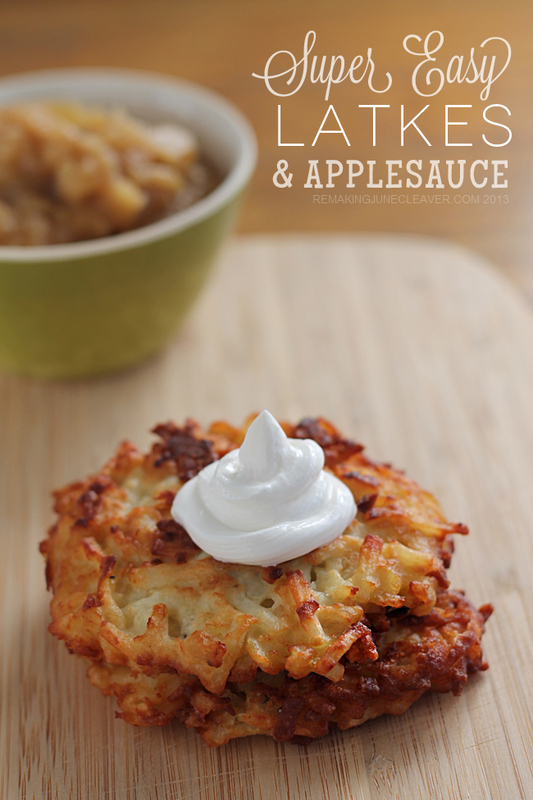 I’m usually in the kitchen frying latkes for quite a while. 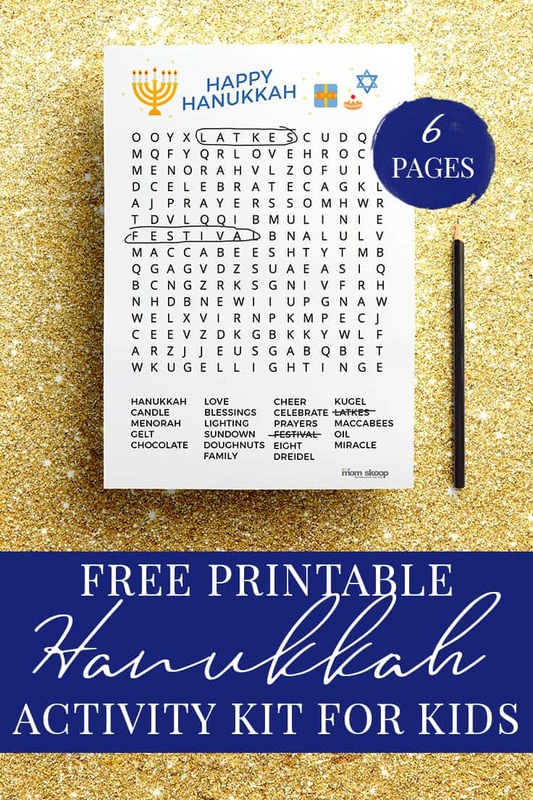 That’s where a printable Hanukkah activity pack for kids comes in handy! Our blended-faith family has the joy of celebrating two holidays this time of year: Christmas and Hanukkah. 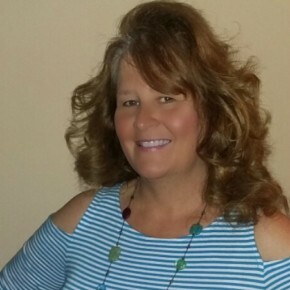 While most of my readers are quite familiar with the story of Christmas, you may not know exactly what is behind the Festival of Lights and all of the delicious foods prepared each year. 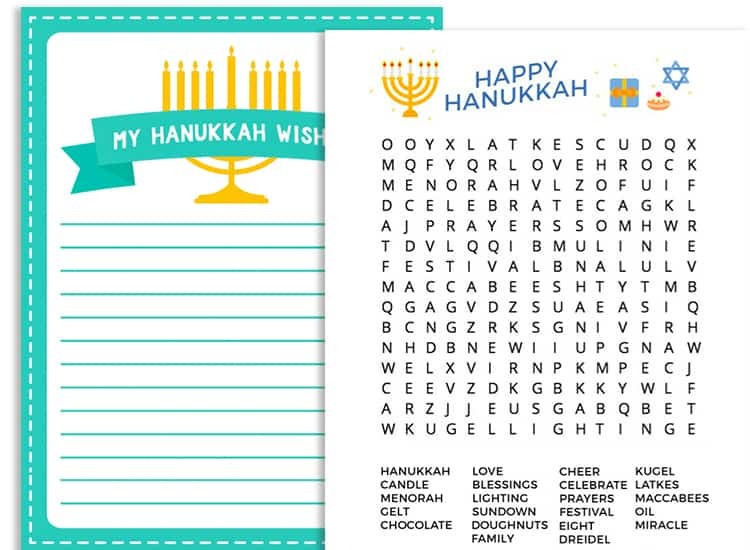 The Hanukkah activity pack comes with 6 original Hanukkah activity printables. 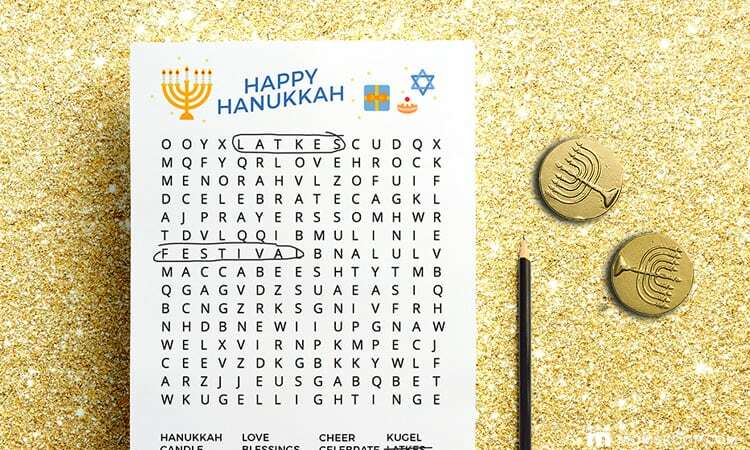 The first two are a Hanukkah wishes list and a Hanukkah word search. This is a great way for the adults to have fun too – helping the smaller ones find all the words. Read on to find out what other treats you’ll get with this free download! Don’t Forget Extra Gelt & Dreidels! Create a Kid Space — We always have a small table and chairs covered with coloring pages, crayons, puzzles & more. Cookie Station — Let kids decorate pre-baked cookies to be served after dinner. Play Waiter — Give kids a notepad and pencil, letting them walk around the group asking what each guest would like to drink. Kid Karaoke — set up a singing spot in the living room with a Hanukkah music cd and wireless microphone. Indoor Scavenger Hunt — Make a list of both common and holiday items they can find around the house. Award a prize to everyone who finishes. 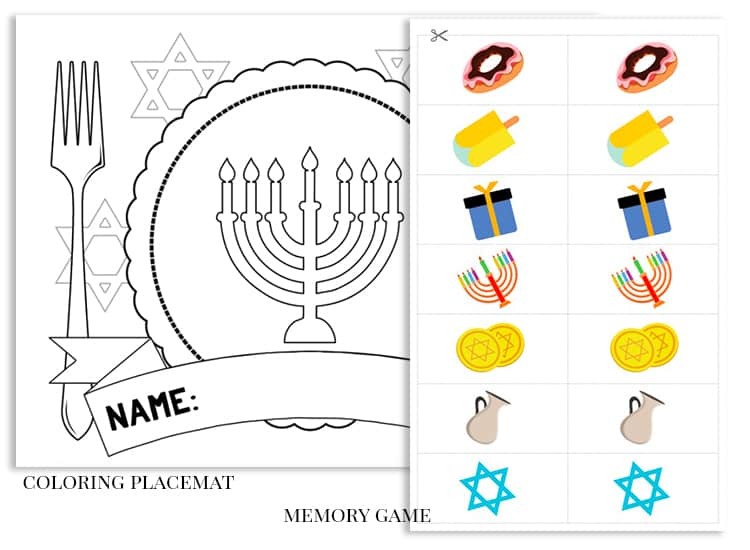 Also included: a coloring placemat with a spot for each child’s name and a Hanukkah memory game. 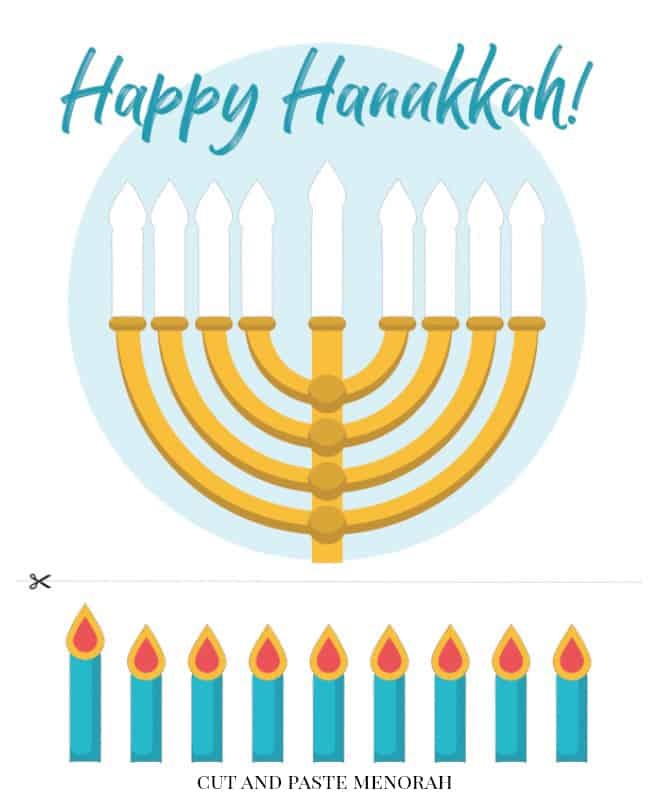 Our final Hanukkah printable sheet is this cut and paste Menorah. This is a great item to put on the kid’s activity table with some safety scissors and glue sticks. You can also add glitter markers for extra sparkle! 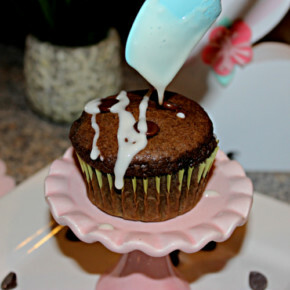 ICE CREAM PARTY TIME plus FREE Party Printables!